As a long time Melbournian but having grown up in Sydney, it’s been eons since I last visited Windsor (I had some school camps there in the 60s!!). It’s somewhat changed in the intervening decades! Thankfully, there’s still beautiful bushland and the mighty Hawkesbury chugs along regardless. Historic Windsor retains its charm and the festival sits comfortably in an easy way, allowing a short walk between venues, attractions and camp grounds. Music fans could wander between classic pub stage blues, street performances, elegant bowling club shows and, of course, the great ticketed shows that are such a memorable feature of the festival. With an array of styles relating to blues and roots from solo acoustic acts such as Phil Manning, Mike Elrington to the grace of Rick Price and visiting US guitar giant Chris Cain, there was something for all preferences. Chris Cain has that sound born of the BB school but also wonderfully channelling many modern jazz and fusion influences with a voice that’s steeped in traditional expression. Mr Manning needs no introduction to Australian blues fans and of course Mike is an emerging force on the scene. 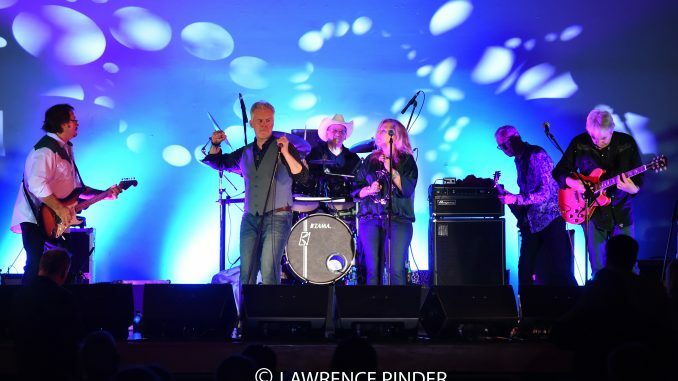 The Windsor Function Centre played host to the first ever electric re-incarnation of one of our legendary bands “Stars”. Their time was tragically cut short by the passing of their primary composer, Andy Durant, in 1980. The double LP “Andy Durant Memorial Concert” reached number 8 on the national charts and is considered an iconic album and a testament to a truly great song-book. The re-formed “Stars” features all the remaining original members with the addition of Tracy Kingman on backing vocals and yours truly on second guitar. Mick Pealing remains one of Australia’s great vocalists while Mal Eastick is acknowledged universally as one of our all-time guitar gods. Combine that with the elegant rhythm section of Roger McLachlan on bass and Glyn Dowding on drums and you can appreciate the quality of the show. The songs were re-visited in all their glory and, in particular, the hits “You Better Look after Yourself” and “Mighty Rock” lifted the roof on a packed venue. It was also wonderful to see the re-emergence of Mario Millo (from the acclaimed “Sebastian Hardy”) and notably “Diesel” who never fails to deliver. I would love to have had the time to see the plethora of other talent on hand! All in all the Sydney Blues and Roots Festival continues to grow and delight, thanks to the tireless efforts of the organizers Dave Wilkins and Peter Fricker. I expect future festivals will be no less exhilarating.